Quick overview Long waited second edition of this popular exploration of media economics. Will be adopted on courses across media management, media policy and the creative industries. "Expertly synthesizes economic theory and contemporary cases to both explain the structure of the contemporary media industry and shed insight on the significant challenges and controversies confronting the sector." "A wide-ranging, accessible introduction to media economics and their application to a broad range of media topics from advertising and business models to copyright, audience demand and public policy." "An excellent textbook on media economics, which takes into account the full complexity of the subject matter in the context of structural, technological and creative transformations that characterise digital media." With the rapidly evolving digital media landscape, this second and completely revised edition of Understanding Media Economics moves beyond a sector-specific approach to media analysis, and instead focuses on the issues and imperatives that are now central to how economic forces impact on the media industries. Exploring themes such as innovation, digital multi-platform developments, the emerging importance of networks, branding and segmentation of market demand, strategies of risk-spreading, maximizing value within content, intermediation and rights management, corporate expansion and advertising, this book addresses and explains the key pressing questions and issues that are transforming contemporary media industries and markets. 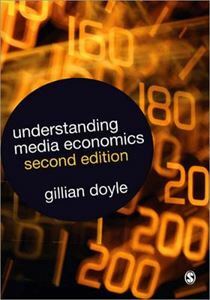 Gillian Doyle makes the economics of the media fascinating, compelling and easy to understand. This is essential reading for students of media economics, media management, media policy and courses across the cultural and creative industries.